Without a lookup, it's 100% an argiope sp. Doing the lookup now. Will have a better answer shortly. Haha! That's what I get for posting before I looked it up. 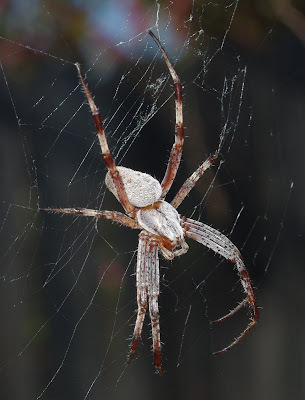 It's in the Araneidae family, but not an Argiope. The latin name is Araneidae Metepeira crassipes. The common is just "orb weaver." If we take RW's estimate of 2.5'' at face value, the body would be almost 2cm long. Even if we assume a .5'' overestimation (a fairly big one), the body would still be some 1.5cm. Both are clearly a lot larger than .72cm, being more than twice the size. I realize these are VERY rough estimates, but for the spider in the pic to be 7.2mm, the leg span would have to be only 1.46 inches long. it's certainly possible that RW superexaggerated the size of the spider, especially since he's an arachnophobe, but Metepeira crassipes just sounds too small to fit the bill. Because I have way too much time on my hands and I have no life (actually, I'm just procrastinating), I decided to make life-size estimates of the three sizes I mentioned above. RW, do you think that the spider you saw was the size of the spider in the smallest picture? Looks like a regular old orb weaver to me. But enough reason to stay out of California. That's fantastic, Trophi! I'd say she was a hair smaller than the second largest photo. Mind you, she's one of the biggest I've seen. Most of them are smaller. Now they're almost entirely gone ... gone the way of Charlotte. Thanks for spending so much time on it, Jade. And dedicabl captcha, you are wise to second guess my estimation of spider sizes. They all look monstrously large to me. Gorgeous creature, whatever she is! I don't care what variety she is. I would not get close to her! !